When I became a mother I experienced a profound shift in the content of my personal work. In the three years prior to the birth of my twins, my work had been predominated by studies of human figures in space, either solo, interacting with others, or interacting with themselves. Upon their birth, I found my artistic path veering off in a different direction. 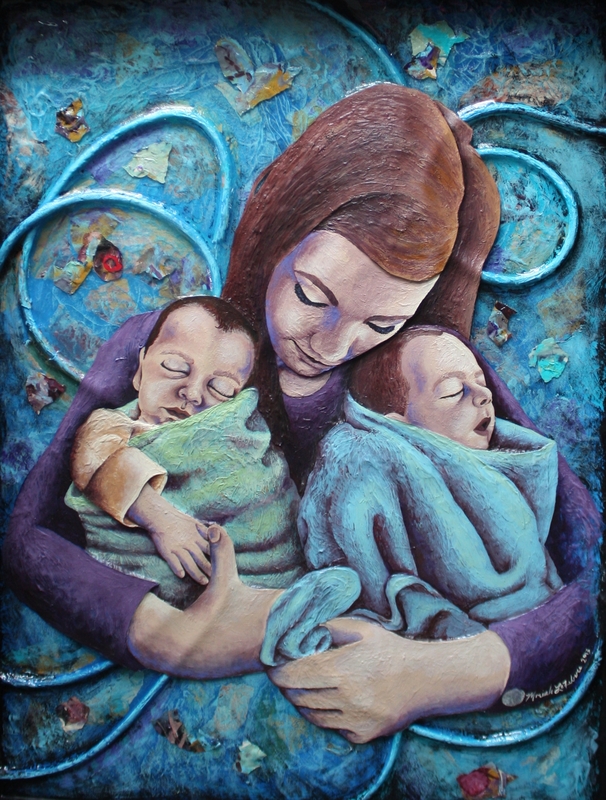 The first painting I did as a mother was, unsurprisingly, a painting of my three children (my stepdaughter and my sons). After this painting I found myself suddenly drawn to the idea of painting animals, something that had never much interested me before. I had previously done several commissioned pencil drawings of animals and one painting that was an investigation of finding the untamed animalistic nature within a human subject (the first image in this gallery). But it was something new for me to be genuinely compelled, over the span of months, to create a series of mixed media paintings of animals. In part, I found the experience of early motherhood so life-altering that I needed to take a hiatus from my previous work and re-establish a new footing. Additionally, once I became a mother, the commonalities between the human life and animal life were differently apparent to me. The experience of carrying, birthing, feeding, and nurturing my children was so primal and natural—I found my awareness of our physical strengths, frailties, and vulnerabilities as animal beings sharply come into focus. I found myself suddenly pre-occupied with the idea of life cycle, aware of my own mortality in a new and sobering way. In light of these perspectives, animals became a relevant, meaningful, and compelling subject matter I was eager to explore.